West Liberty-Salem’s Jamie Peterson (right) taps a ball over the outstretched hands of Triad’s Allyssa Eaton on Monday. 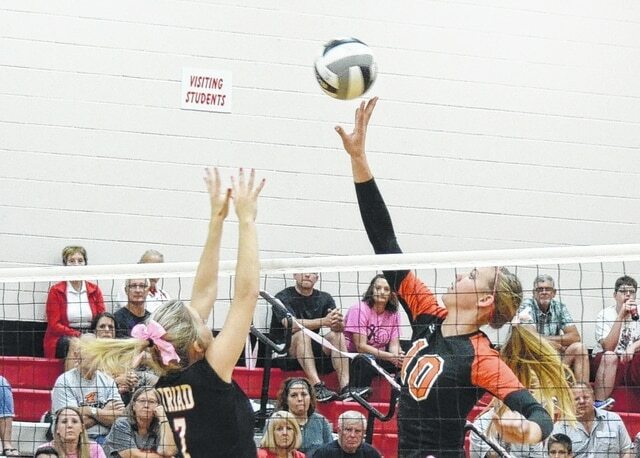 West Liberty-Salem defeated Triad, 25-16, 25-20, 25-13, in OHC volleyball on Monday. It was also a “Volley for the Cure” match, with a portion of proceeds benefiting the Susan G. Komen for the Cure organization. For Triad, Madison Dolby had 6 kills and 4 aces. Jenna Ober had 10 digs and Allyssa Eaton had 4 blocks. WL-S stats were not reported by press time. Triad won the junior varsity match 25-20, 25-16. Kaitlynn Pence had 5 kills, Jennifer Sizemore had 9 assists, 9 points and 2 aces. Kayleigh Rice had 11 digs, Tori Thomas had 18 points and 8 digs and Kristin Bailey had 8 points for the Cardinals (8-6, 8-3). Triad’s varsity team (4-11, 3-8 OHC) hosts Northeastern on Thursday. Mechanicsburg beat Cedarville in OHC volleyball on Monday. Mechanicsburg is now 10-7, 7-4. WL-S defeated Bethel, 4-0, in jayvee girls soccer on Monday. Goals were scored by Peyton Kerns (2), Mindy Bailey and Korinne King. Bell Clark had an assist. Laura Neer had 3 saves in goal and Rachel McGill added 5. The WL-S 7th graders lost to Miami View, 25-27, 25-20, 25-20. Olivia Muirhead had 10 aces and Selena Weaver and Kayleigh Wilcox added 3 good serve receives for the Tigers. The 8th graders lost, 20-25, 25-20, 25-18. Kaylah Erwin had 5 aces and 3 kills, Alex Burton added 3 kills and 4 good serve receives, Peyton Orahood had 3 good serve receives and Sydnee Payer added 4 kills for WL-S.
For the third straight week, an Urbana University men’s soccer player has picked up an award from the Mountain East Conference. The league office announced Monday that UU graduate student Raoui Lassoued has been selected the MEC Offensive Player of the Week. Lassoued, a native of Paris, France, scored two goals and recorded an assist to help No. 23 UU collect two MEC wins, while extending the team’s win streak to seven games last week. Both of Lassoued’s goals came in the second half at Wheeling Jesuit last Saturday, as the Blue Knights produced a season-high four goals in a shutout win. The 5-foot-11 forward struck with a pair of brilliant finishes, including a highlight reel 30-yard strike from straight on in the 64th minute to put UU ahead 3-0. Lassoued then added his second goal from the left wing, thanks to a Lars Blenckers assist with 10 minutes left in regulation. Lassoued is second on the team with five goals in his first year as a Blue Knight. He also provided an assist on UU’s game-winner in a 3-1 triumph over Shepherd last Wednesday. Lassoued is the third Blue Knight to receive player of the week recognition this season, joining goalkeeper Nate Jones (Sept. 28) and forward Mike McFarlane (Sept. 21). The Blue Knights continue league play on Tuesday when they travel to rival No. 25 Notre Dame College. UU knocked off the Falcons earlier this season, 3-2. Match start time is scheduled at 4 p.m. in Euclid, Ohio. https://www.urbanacitizen.com/wp-content/uploads/sites/36/2015/10/web1_Peterson100515.jpgWest Liberty-Salem’s Jamie Peterson (right) taps a ball over the outstretched hands of Triad’s Allyssa Eaton on Monday.